The product quality is inspected and only carefully selected raw materials, that undergo quality checks prior to processing, are used. During quality processing, the raw materials are examined for pollutants, toxins, heavy metals, pesticides and salmonella. Thus, we are able to guarantee optimum quality, always. 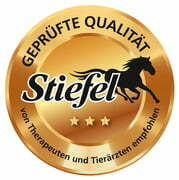 Furthermore, our production is ISO 9001 TÜV-certified and forms the basis for our high-quality Stiefel products. Only the best for your horse!